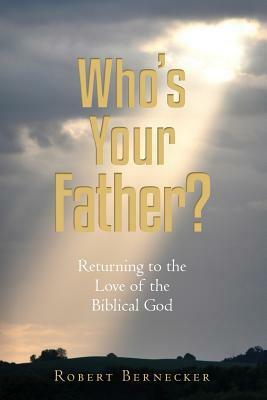 Last year I was contacted by the author of Who’s Your Father? Robert Bernecker, who asked me if I’d read and review his book, which he had recently published. He was kind enough to send me a copy and patient enough to wait for me to read it. Mr. Bernecker is not a theologian, pastor, or seminary professor, but merely a layman who came to an understanding of the sovereignty of God through his own personal, in-depth study of the Scriptures. His book is written for the lay Christian and is chock full of scriptures. For example, Bernecker cites or quotes some 80 verses or passages in just the first chapter of 16 pages to support or illustrate his points. He also draws from the works of many highly-respected Puritans, Reformers, preachers, evangelists and authors, including: Augustine, Tyndale, Luther, Whitefield, Edwards, Spurgeon, Tozer, Pink, Packer, Boice, and Sproul, as well as others. The topic of Bernecker’s book is the important and much-debated topic of the sovereignty of God, a biblical truth and beloved doctrine held by the early Reformers, but resisted and even denied by some Christians today. Americans historically are do-it-yourselfers who take pride in being independent, self-sufficient individuals who have attained success by “pulling ourselves up by our own bootstraps,” if you will forgive the use of the cliché. But the idea of a person being “the master of one’s own destiny” is nothing less than atheistic thinking, and the boast of being a “self-made man” is a prideful denial of God’s sovereignty. I believe this mindset has to some extent carried over into our theology and has undermined this doctrine. While the belief in God’s sovereignty is often said to be balanced by the truth of man’s responsibility, many churches have no problem emphasizing the latter, while neglecting or downplaying the former. Many who are not professing Christians are willing to concede the existence of God, at least “a detached hands-off observer-god,” but Bernecker sets forth many scriptures to show that this is not the God of the Bible – scriptures that describe a God who did not merely set universal laws and “mother nature” into motion, but who is actively involved in and is the first cause of everything that takes place. …a god who does not get what he wants is not God at all. There would necessarily be some limitation to that supposed god’s power, knowledge, resources, or abilities – otherwise that god would, in fact, be able to get what he wanted and to do exactly as he pleased. Our God is the author of both the miraculous and the mundane, and this is a realization that will revolutionize our walk with our Father… It is common for people of our day to label an unusual event that they perceive to be a good thing as “a God thing”…Our error is to attempt to compartmentalize those things that we will choose to allow to be God things while refusing to acknowledge God’s involvement in those things we perceive as less than spectacular. I have to admit, I wince whenever someone remarks, “It was a God thing.” I just want to reply, “Isn’t everything really a God thing?” Not that everything that goes my way is a “miracle” (like finding a close parking spot in a crowded mall lot, for example.) God sometimes intervenes in supernatural ways, but MOST of the time He just uses what are called ordinary means – people, laws of nature (that He put into place), modern technology, etc. to accomplish HIS ordained purposes. Robert Bernecker goes on to address another attitude or view held by people, particularly Christians, regarding God, and that’s the idea that God is a gentleman who would never force His influence or even His love on a person who didn’t want or ask for it. Those who hold this view seem to feel the need to defend God and to protect His reputation, but in so doing, they unwittingly present a picture of God that is not to be found in Scripture. Where, I ask, does this idea of a Gentleman God come from within the Word of God? The author provides numerous examples from Scripture where God intervened and influenced the attitudes, emotions, wills, desires, and decisions of men in order to bring about His ordained purposes. In fact, when we pray to God to accomplish something, aren’t we often asking God to influence the will, desire, and/or actions of others? For example, if we pray for someone to get a job, aren’t we asking God to intervene in the situation, to open a job position somewhere, and to influence the will of the person making the hiring decision? The author doesn’t deny that humans have a will and do make choices and decisions, but he addresses the question, Which comes first – God’s decree or man’s decision? Which has more weight or plays a more significant role in the outcome of any situation? Knowing that God works with the choices of man and intervenes in their will and choices is actually a comforting and freeing truth (see Prov. 19:21, 16:9; Eccl. 7:13). It means that I can make plans and decisions in faith, knowing that nothing I do will ruin, interfere, or thwart God’s plan or purposes. Again I ask, Why do Christians resist this truth, when it is in goodness, love, and wisdom that our Father acts and intervenes on our behalf and for our good? Bernecker also discusses the implications of the foreknowledge of God, what it means and especially what it doesn’t and can’t mean. He explains that God isn’t merely responding to the choices and actions of men, nor anticipating their actions and adapting accordingly. Jeremiah 51:12 tells us, “The Lord has both purposed and performed what He spoke.” (See also Is. 46:10-11.) As Bernecker puts it, “God’s words do not merely predict history, but rather the unfolding of history fulfills God’s words…when God foretells the future, he is actually stating what it is that he will do in the future, not merely what will happen.” In his discussion about God’s knowledge of the future, Bernecker also touches on the modern belief system known as open theism – a false view that teaches that God is limited in His knowledge and is always growing and learning. This view is becoming increasingly more popular because “the church is already well down the road of ripping sovereignty from God and handing it to humans who are only too delighted to accept such ‘empowering’ doctrines,” as Bernecker observes. Bernecker talks about God’s sovereignty not only in the universe at large and in individual lives in general, but specifically with regard to salvation. He discusses in some depth the idea of man’s free will, a pet subject for many modern evangelicals. Salvation is an area where many Christians especially like to limit God’s sovereignty. Sure, He causes it to rain. Yes, He heals people of sickness. Okay, He provided Dad with a needed job. But wait, He changed a person’s heart? Okay, now you’ve gone too far. In fact, the same person that insists that God allows man to exert his own free will to choose Him, will also pray for the salvation of a lost loved one. I find this ironic, because in doing so, isn’t he actually asking God to influence the heart and will of the lost person? With regard to the role of man’s will in salvation, the question may be stated like this: Does a person become a child of God if and when he responds to the Gospel and believes in Christ? Or does he repent and come to faith in Christ because he had been “chosen before the foundation of the world” by God (Eph. 1:4) to be His child (which is what Bernecker and I believe the Bible teaches)? This is how some Christians describe conversion: God is offering everyone a gift – His Son/Salvation – and all you have to do is reach out and accept it (citing John 1:12). But, it’s your decision to make, for God is not a celestial puppeteer, and we are not merely robots, they would argue. Bernecker deals with this common objection against the doctrine of election and the role of God’s sovereignty in salvation. It requires an act of God to intervene in circumstances, open the eyes of the blind, and make that which was spiritually dead alive, enabling the sinner to hear and his will to respond to the Gospel. God does more than offer salvation — He grants repentance and faith to the sinner. It’s God who softens or hardens a heart – turns one toward repentance and leaves another in his state of rebellion. While from our perspective, a man makes the decision to place his faith in Christ, God’s work of grace precedes human choice – it must or else salvation would be brought about by the will of man, which many verses such as John 1:13, John 8:42-47, and Romans 9:16 clearly deny. How many unbelievers, or even outright atheists, would certainly choose to believe if they too were stopped in their tracks by supernatural, blinding light and the deafening voice of the resurrected Jesus calling them by name?…Some people are given a greater exposure to the Gospel than others, and some people that would surely repent if they were exposed to the Gospel are not given the opportunity…on the other hand, Romans 8:28-30 teaches us that God will do all that is necessary to save those people whom he has chosen. I do not understand how it is possible to exaggerate God’s sovereignty. To exaggerate is to present something as greater than it really is. How is this possible? God’s sovereignty is infinite and absolute. How can one ever present that sovereignty as greater than it really is? Our Father is unlimited in perception, unlimited in power, unlimited in ability, unlimited in resources, and unlimited in wisdom…such a realization can yield nothing less than unmitigated worship and adoration for our Father, who is sovereign over every detail in the universe and still chooses us to be his very own. Confidence in prayer comes not from knowing that we can change our Father’s purpose, but rather from knowing that his purpose can never be changed…We pray confidently, knowing that we are not attempting to alter God’s perfect purpose with our own ideas; rather, we are affirming and accomplishing his perfect purpose with our prayers! With this attitude we surely can go boldly to the throne of grace with our needs and concerns! Robert Bernecker’s desire and intent for his book, Who’s Your Father? is primarily to remind the Christian reader that God’s sovereignty is closely linked to His love for His children. Having a proper view of God’s sovereignty will inspire awe, love, faith, and worship towards our God. Confident belief in God’s sovereignty will affect our worship, our prayer life, our attitude in trying circumstances, and our approach in witnessing to the lost. If as a Christian you have struggled with understanding or accepting just how sovereign God is, I believe this book will provide much food for thought along with the Biblical grounds for seeing and embracing this tremendous aspect of our Heavenly Father. Today, you are in one of two places: either you are in the arms of a loving, all-sovereign God who is your Father, or you are in the hands of an angry God who is your Judge. There is no other option. Where are you? On a personal note: Just this past week I came to see the sovereign hand of God as a friend of mine died suddenly from the flu. Jessica was a follower of I’m All Booked and commented here frequently, and I’ll miss her encouraging posts. But I rest in the knowledge that God has ordained every day of each life, and in His wisdom and goodness had determined that it was her time to join Him. This entry was posted in Christian Books, Non-Fiction and tagged Election, God's Sovereignty, man's free will, Robert Bernecker, Who's your father. Bookmark the permalink. With Father’s Day upon us once again, my thoughts went to a friend who recently lost her dad, whom she loved very much. I lost my own dad over 25 years ago and miss him being in my life all of those years. But not everyone has close ties with and fond memories of their father. Some people grow up never even knowing or having much of a relationship with their dad, which is heartbreaking. Regardless of what your relationship to your own dad has been like, no father is perfect; every earthly dad has his flaws and makes his share of mistakes, albeit some more than others. God is a perfect, holy, loving Father to His children, and He has promised to be a Father to the fatherless. The question is – who are His children? Is every person in fact a child of God? No matter who are you are – He is your God and He is your Creator, whether you acknowledge Him as such or not. Many like to think of God as being their Father without really knowing much about Him. God is not what you want or think Him to be. He is who He has declared Himself to be, and He has revealed Himself to us in His Word, the Bible, and through His Son, the Lord Jesus Christ. So let me to ask you to consider: Who is your Father? Here are some thoughts from a book I reviewed a few years ago.